I just hope it doesn’t lead to vested interests saying Ireland should increase spending where Ireland is lagging behind other countries in GDP terms. Is Ireland Inc the next Switzerland except instead of handling cash, it recognises overseas trade as having occured within its borders for a very reasonable fee/charge. Crazy outlier. Especially the gnp figures. It’s just not the experience on ground is it? Of course it won’t stop fr. Sean Healy, Boyd Barrett etc. quoting the figures when they want more spending. Or union pay claims. So if the economy has recovered so well, does this mean ‘austerity’ worked. (While we’ve been bombarded with tales all along that it doesn’t/couldn’t/shouldn’t work). This is nonsensical. Did an Irish-based company buy to lease half the world’s aircraft in 2015 or did some other such artifice affect the GDP figures? What’s worse is that it is making the debt-to-GDP ratio look good, nominally down to 80%, despite an artificial GDP having no bearing on taxpayers ability to repay our lending. I was looking at the CSO website for a good 10 minutes earlier before I could get my head around what it was actually saying. I’ll have to wait until later in the day to see some of the experts clarify exactly what this means, but it seems there has been a massive jump in industry. R&D more than doubled to over €20 billion in a single year. That seems bizarre. Actual tax take grew by 10.5% last year according to Revenue, so clearly it was a year of rapid growth. But 20%+ doesn’t reflect in any realistic way the experience of the average citizen. There are 23 references to GDP in this document and no references to GNP. Whether this is a good thing or not is subjective. One man’s corrective procedure is another’s death spiral. What are the latest unemployment figures now? Even the Chinese wouldn’t try this. Always a good time to revisit Seamus Coffey’s demonstration from 3 years ago of how - even then - Ireland’s GDP was about 20% “fresh air” (i.e. an accounting transaction). It must be closer to 40-50% now. How are we going to decide how to allocate resources in our society vs. other international benchmarks (i.e. Healthcare per GDP, Education per GDP), when our national accounts are so distorted (and manipulated)? With the UK now gone from the EU, we will loose the strongest ally in applying the “tax veto” over any change to our tax evasion economy. The ECB are the only things keeping our banks alive. Will we be able to withstand the pressure to drop our veto, now that the scale of the tax evasion being done via Ireland is going parabolic ? The CSO numbers were marginal 5 years ago, now completely meaningless. It is now a pure Cayman Islands economy. What that means is that given a different tax regime in the US and /or EU almost 40% of the GDP could disappear in one or two years. Switzerland unlike Ireland actually does have a real economy. Like local companies making things. The CSO numbers were marginal 5 years ago, now completely mealiness. 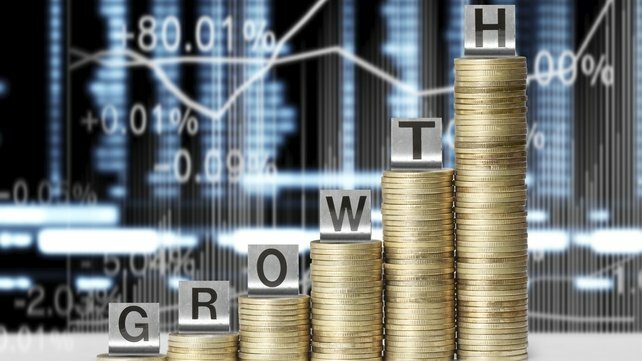 Ireland has a real economy too; it is just very small and when the country chases metrics at the expense of the local economy it undermines the sustainability of the local economy. Quite true. Last time I looked it was on the same order as NZ and slightly better than Portugal. Very very different from the Norway, Denmark, Finland, Switzerland equivalents according to the official numbers. I think a quick look at the NZ economy is a good benchmark for what the Irish economy actually looks like sans MNC tax evasion sectors. Except NZ has an ultra efficient vertically integrated agricultural sector and their government expenditure was reformed back in the 1980’s. Seamus Coffey has an analysis up now on the irish economy blog. This is true, but as it is all smoke and daggers anyway, it wouldn’t have a huge impact. Just less of other people’s money being routed untouched through our economy. Well in the scenario where the MNC tax evasion sector is gutted is also the scenario where the government start having to pay actual capital market rates for sovereign debt. Only the big boys get to hold on to ZIRP. As their CB’s already hold most of their own bonds anyway. So that means all income tax and VAT revenue just to pay interest. And no rollover. And as it seems more than 50% of the cash flows in the real world economy seem to be directly or indirectly due to government expenditure we are looking at a South American style contraction in the real world economy in a very short period of time. The fake official statistics do have real world consequences. In the long run. Knock down from 255BN to 125bn GDP and Ireland would loose 5 to 10 billion of tax/activity in the economy(David Drumm type figure but as good a place to start as any) They definitely do contribute to the taxable income of the country. We live in a World where 125 billion is still a lot of money and pays a lot of national defence budgets. If Ireland thought it could continue to operate as a tax haven indefinitely haivng got over the moral hurdle of creating a world where the wealthy and businesses don’t have to pay much tax then that would be one thing but these Countries will not stand idly by indefinitely and let their tax bases be eroded. Bank of Irelnd shares fell almost immediately when the news was released. A lot of US hedge funds just realising that Ireland’s national accounts are an illusion. This could be the death of the Celtic Tiger illusion, when modest MNC contributions to our economy, lead to massive Irish GDP / GNP distortions, which in turn led to massive in-flows of cheap credit (via Irish banks) to fuel an Irish property boom, and give the locals a chance to live up to the lifestyle of the illusion of having one of Europe’s highest GDP (and GNP) per Cap. They should have found a way to adjust these figures down to at least give some credibility to the illusion. Now we just look stupid (going see international pictures of leprechauns associated with our economy). And if the EU was in any doubt that Ireland is the EU capital of tax evasion, they aren’t now (just when our veto partner in tax evasion, the Brits, exit stage left). There’s a long history of this. 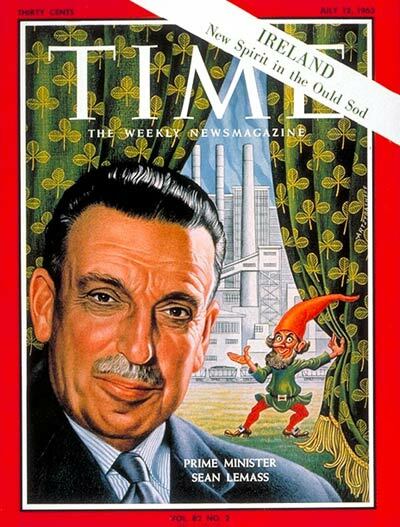 Here, the Leprechaun of Imaginary Heavy Industry leers at Sean LeMass. Back in the real world, working in sales into the real economy, those figures scare the crap out of me. Just when things seemed to be getting back on track, SME businesses finally showing (single figure) growth. Have seen a few things of late that have put the heeby jeebies up me, two off the wall commercial retail property deals that have gone through, at least one heavily financed by a pillar bank. Have tried making the figures stack up on my own back of the envelope calculations but haven’t succeeded yet. Same financial institutes back to their wining and dining best. Now this, the CSO reporting that the economy is growing at 26 fckuing per cent. Not good. RTE are reporting the numbers uncritically. Either the journos don’t have a clue, or they believe the general public are on top of this stuff. you’d think they’d be trying to palm off some of their own space on buyers seeing as there is a market for it and the market is moving to cashless. Didn’t the major banks sell up most of their premises a year or so before the last crash?